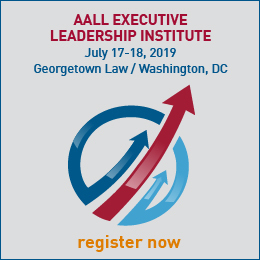 AALL's Strategic Plan envisions that AALL and its members will be the recognized authority in all aspects of legal information. 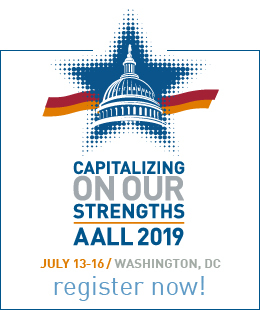 AALL's Research Agenda seeks to make that vision a reality by stimulating a diverse range of scholarship related to and supportive of the profession of law librarianship. Law librarianship encompasses a wide range of job responsibilities in a variety of settings, based on a foundation of a common bibliography, the provision of information services, and the assistance of users with their research needs. New communications technologies and platforms offer myriad opportunities to improve, expand, and enhance the profession, while they continue to change the work and workplace of law librarians. The Research Agenda is structured to promote exploration of these changes, and others, as they affect the profession. An essential underpinning of the Research Agenda is the assurance of intellectual freedom in Association-sponsored research. AALL recognizes the principle of intellectual freedom in its Government Relations Policy and the Library Bill of Rights of the American Library Association. Intellectual freedom is a cornerstone of librarianship. It allows researchers to explore new areas of knowledge and reach conclusions and recommendations free from oversight and pre-determined results. The American Association of Law Libraries adheres to the principles of intellectual freedom and does not seek specific outcomes from any research produced under its auspices. The Research Agenda is not comprehensive. It will evolve as research projects are completed and conditions warrant. The AALL LexisNexis Research Grant Jury invites law librarians and other interested researchers to explore the items listed in the Research Agenda, and looks forward to working with them to develop research projects and publicize their results. The AALL Strategic Plan sets the goal that AALL and its members will influence legal and government information policies in the public and private sectors. How can law librarians most effectively advocate for improvements in the quality and availability of legal information products and services? How can law librarians most effectively advocate that government information be in the public domain and that information on government websites be permanently available to the public at no charge? How can law librarians most effectively promote the value of public law libraries and of adequate resources to ensure access to justice? The formal status of the librarian within a broader institution creates a range of consequences both intended and unintended for both the individual and the organization. These structural arrangements should be investigated in terms of both their perceived significance as well as their actual impacts on the exercise of professional responsibilities. How can AALL members achieve the goal of becoming the recognized authority in all aspects of legal information? How can law librarians increase their recognition as essential to the success of their institutions? How can law librarians enhance the effectiveness of partnerships with allied professionals? Career tracks: How do outcomes of professional careers vary in different areas of law librarianship, by organizational status, etc.? Tenure status: Do librarians need tenure protections, or if so, in what situations? How do librarians view performance expectations to achieve tenure? What are some different models of law librarians' continuing status? How are such models similar and different from tenure and what are the implications for librarians, institutions, and the profession as a whole? Education requirements: Is a dual J.D.-M.L.S. degree requirement appropriate for certain positions? Does the dual degree requirement help or hinder professional goals such as tenure, increased status, etc.? Professional status as an internalized identity or externally applied label. The social importance of libraries may not be limited to their pragmatic utility as a source of information, but may also encompass the perception and attitudinal associations of libraries by students, faculty, patrons, and the community at large. The library as institutional memory/identity. Formative emotional and cognitive associations centering on the library experience. Proper management of people, finances, and facilities is vital to the success of libraries. Because general theories of management may or may not apply to the specialized law library environment, or to particular types of law libraries, research is necessary to understand the extent to which general management theory applies to particular law library environments. Effective team dynamics: How to create and motivate teams both within and across departmental lines? How can librarians' job duties and position descriptions be structured to foster creative problem solving and innovation? What mechanisms exist for proving the value of a library to its parent organization? How would such mechanisms work for law libraries in private, governmental, and academic settings? What system or method of professional evaluation best promotes motivated and productive librarians and staff? How can the financial and other benefits of law librarians to their institutions be quantified and documented? How can the needs of library users be analyzed and measured? The AALL Strategic Plan sets the goal that AALL will become the premier provider of education to legal information and allied professionals. What are the appropriate standards for legal research and other competencies taught by law librarians? What is the appropriate curriculum to ensure that such competencies are taught effectively? How can law libraries offer instruction to remote patrons? How can new technologies, social media, etc. be utilized to enhance legal research instruction? What implications does globalization of the practice and teaching of law hold for law libraries and their patrons? How can libraries help meet the legal information needs of pro se patrons? How can libraries best serve the legal information needs of patrons from culturally diverse backgrounds? How can libraries best serve the legal information needs of persons with disabilities? As information technology continues to evolve, research is needed on how law libraries can continue to utilize technology to provide effective services while avoiding formats and equipment that will too quickly become obsolete. Implications and best practices in transitioning from tape and disk-based technologies to streaming and cloud technologies. Implications and best practices relating to the rise of mobile technology. Changing needs of users have resulted in drastic changes in the operations of law libraries' technical services departments. As platforms and technologies change, technical services will be expected to enable their libraries to provide relevant, engaged, and customized information content and services based on pervasive information infrastructures and computing environments that integrate people, organizations, processes, data, and technologies. What training and expertise will be needed for personnel in technical services? How can existing personnel be retrained to acquire these new skills? What techniques are available for management of technical services, including communication, teamwork, goal setting, quality control, measurement, and accountability? How can technical services departments and public services departments enhance their support for one another? The information technology revolution has affected the composition of law library collections, the structure of bibliographical data, the way patrons seek and access legal information, and the way materials are being processed by libraries and accessed by patrons. With their increasing digital nature, library collections are becoming part of the web infrastructure. Libraries must compete with search engines and websites for patrons' research requirements. Libraries are expected to create exciting and user-friendly search interfaces and research portals to effectively deliver information to patrons. The move from classic online catalogs to open source catalogs or platforms allowing Web 2.0 functionalities. The catalog's support of the library in its role as a gateway to information. Creating research portals such as library content and service distribution toolkits. Metadata structure, bibliographical standards, schemas and conceptual models for discovery and access (FRBR- Functional Requirements for Bibliographic Records, RDA- Resource Description and Access, MARC, Taxonomies, Ontologies, etc.). Innovative approaches to bibliographic control. Semantic interoperability between various metadata schemas. OPACs as part of the semantic WEB. The development and use of discovery platforms. Real time online connection between libraries' holdings and corresponding curriculum courses. On-demand generation of information resources (e.g. tutorials, RSS, distance learners, etc.). Libraries serve as knowledge and information archives to their user communities, and preservation of materials is an essential component of this role. Advanced technology for preservation of materials in various formats. Developing in-house expertise in digital resources curation, production & preservation. Conversion and preservation of video, sound and print objects from their original media into digital ones. Developing and supporting unique collections. Case studies on effective advocacy efforts to ensure the authentication and preservation of official digital resources. Acquisitions and collections services are central functions of law libraries. As buyers, libraries selectively acquire or subscribe to information resources, including print materials and electronic materials distributed by vendors. In collaboration with external and internal partners, libraries also purchase IT infrastructure for auto-processing information resources in various formats. Transformation of collections in academic, firm, and governmental settings. Management of finances for acquisitions. Common digital collections across libraries. As many law libraries use fewer paper and more electronic resources, they face the challenge of selecting, describing, and delivering electronic materials in a manner consistent with the rigorous way that libraries have traditionally managed information. An additional challenge will be to blend digital materials available in a variety of different formats. Best practices in digitization of institution resources. Research on funding sources for digitization projects. Research on the availability of materials in the public domain for digitization. Research on the different ways patons use digital and paper materials. Empirical research methods are commanding a greater prominence within legal scholarship. This emerging trend provokes two separate, but related issues: to what extent should librarians become conversant in these tools in order to assist faculty and students; and what impact would this acquired expertise impact the ways in which librarians approach library management and their own scholarly writings. Empirical research and the nonspecialist reader. The shift from qualitative to quantitative data in law library literature. The role of the law library as technical statistical support. Effective means of communicating trends and patterns. Common mistakes and misunderstandings by writers using data in their writing. The history of law librarianship, including histories of individual libraries and biographies of librarians that have distinguished themselves in either large or small ways, is an important topic of scholarship to the profession. Likewise the history of legal publishing, including publishing histories of governmental bodies and publishing firms, and histories of legal publications in particular jurisdictions or subject areas, are also equally important. Pioneering Librarians and other professionals responsible for innovations in our field. Librarians who had remarkable scholarly output and how that output affected librarianship. Histories of institutions or library programs of significance to the profession. Histories of publications within particular legal topics. An important form of scholarship for our profession is case studies that document both successes and failures in the implementation of programs, methods and systems. Case studies on means to increase library flexibility and responsiveness to changing needs. Case studies on efforts to promote the financial and economic benefits of law libraries and employing law librarians. Case studies describing partnerships with bar associations and other organizations. Case studies describing advocacy at the local, state and federal levels to advance public policies supported by the profession of law librarianship. In light of the AALL Strategic Plan's vision that AALL and its members will be the recognized authority in all aspects of legal information, the creation of bibliographies, legislative histories, indexes, and directories remain valuable forms of scholarship. Bibliographies of legal publications of particular states or foreign jurisdictions. Bibliographies of legal publications within particular subject matters. Historical biographical directories of judges of particular states or jurisdictions. Legislative histories of major state and federal laws. Legislative histories describing the development of statutory law in particular fields of law.